An Áit Eile in Malta: Let the sweating commence! Tomorrow, a few of us on the An Áit Eile team are upping sticks and relocating to Malta. Apart from it’s famous blue waters and 300 or so days of sunshine a year, many of you may have heard about Malta through that aunt of yours who visits it every year and plans to buy a retirement condo there someday, or maybe you’ve been over for a few too many cocktails and a pretty nasty sunburn yourself. For us, it’ll be our first time visiting. So, why Malta, you ask? Well, firstly we fancied a bit of a change from the usual rainy summers in Galway. Also, with all the talk of Galway 2020, when we heard that Malta’s capital city Valletta will be holding the European Capital of Culture title in 2018, we thought we’d check it out and see how they are getting on with the preparations. We hope we can learn from our Maltese counterparts, forge new relationships, and develop potential avenues for collaboration between Malta and Galway in the run up to Galway’s own Capital of Culture in 2020. Did I mention, we also wanted a break from the rain?! 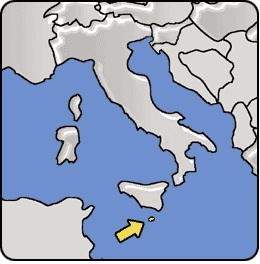 For those of you that don’t know, Malta is an archipelago just off the bottom of Italy in the Mediterranean Sea. The main Island is ‘Malta’, the smaller ones are ‘Gozo’ and ‘Comino’, and then there’s a series of even smaller uninhabited islands too. The official language is Maltese, a unique Semitic language which is descended from Arabic, with a bit of Italian and English thrown in over the years too. English is also the co-official language so hopefully we shouldn’t have too much difficulty getting ourselves set up with meeting people, paying bills and general day to day stuff. With high humidity and daily average temperatures of over 28° in the summer, the weather is going to take a bit more getting used to though, especially with the state of our pasty Irish skin after the last two ‘Summers’ in Galway. When we get to Malta, we will be reviewing arts and culture events, reporting back on Valletta 2018 European Capital of Culture projects, and trying to spread the word about An Áit Eile with a wider European network, hopefully promoting an exchange of knowledge both ways. We’ll also be writing about the realities of starting out in a new place and talking about issues that affect both nations. Malta’s history is way too long and complicated to go into here (it seems to have been occupied by just about every invading force going), but as an Island Nation, strongly Catholic, former British Colony, and famously friendly bunch of people, we have a fair share of things in common. We’ll be writing about things like our experiences of the local music scene in Malta, Cultural Symposiums, local festivals including Valletta Film Festival, Malta International Arts Festival, Marsovin Summer Wine Festival, and any projects that could be of interest to folks back home. Between the three of us on the An Áit Eile team that are departing, we’ve been in Galway for over 30 years, it’s where we’ve spent most of our adult life. We’re originally from (not so) far flung places like London and Donegal, but like so many others, we chose Galway, it’s is our adopted home. Galway is small, friendly, creative…It’s the type of place where you could be chatting and drinking pints and take a notion to write a play, and by the end of the night you’d have your first draft written and the people on the table next to you joining in rehearsing lines. There’s an openness to creative projects here, and a willingness to give it a go. Culture here is a big part of the draw for many, because let’s face it, there aren’t many actual attractions in Galway. As any artist in the city will tell you, however, despite the enthusiasm, there’s a severe lack of arts infrastructure here, and with that, a shortage of paid opportunities in the Arts. It can be easy to find fun and productive volunteer work with one of the myriad of pop up festivals the city has to offer (we’ve even run two festivals ourselves), but sustainable paid work is another thing altogether. So, after many years of college, volunteering, part time work, more college, more volunteering, and years of juggling two or three (or even five) part time jobs, while also sustaining artistic practice and projects of own, the An Áit Eile team members have been involved in a good mix of the cultural production in the city. We’re looking forward to this new opportunity to see how things work elsewhere in Europe. From the everyday things like the frustration of trying to navigate through City Centre Traffic, to global issues such as the increase in homelessness, Suicide, and the treatment of Asylum Seekers, Galway City has its fair share of problems. It will be interesting to see how issues such as Homelessness, Religion, Abortion, the Environment, are being dealt with elsewhere. At the minute we’re still trying to finish getting all our bits and pieces together. We’re finishing packing, transferring savings from Credit Union to current accounts, downloading Maltese Apps, reading blogs, stocking up on the Factor 50 suncream, applying for part time work in random places (Popeye Village sounds pretty fun), and of course, spending time with friends and family before we go. Malta is not the furthest destination or the biggest adventure, and we’re not even sure how long we are going for but we’ll let you know the highs and lows, and hopefully learn a thing or two. We’ll be posting regularly on www.aae.ie and and you can follow us on facebook and Instagram @an_ait_eile_europe. If you are based in Malta and you would like to let us know about an upcoming event, exhibition, gig, local artist, interesting project, or an issue that is important to you, please get in touch with us, we’d love to hear from you. And, if you are based in Galway & the West of Ireland and there’s something you would like us to write about let us know too. Drop us an email to : hello@aae.ie or leave a comment below. I just want to tell you that I am very new to weblog and absolutely liked your page. Most likely I’m want to bookmark your blog . You absolutely come with terrific stories. Cheers for revealing your blog. I will immediately seize your rss as I can not in finding your e-mail subscription hyperlink or newsletter service. Do you have any? Kindly allow me recognise so that I could subscribe. Thanks. obviously like your web-site but you need to test the spelling on several of your posts. Several of them are rife with spelling issues and I in finding it very bothersome to inform the truth nevertheless I¡¦ll surely come back again. I was just seeking this info for some time. After 6 hours of continuous Googleing, finally I got it in your site. I wonder what’s the lack of Google strategy that don’t rank this kind of informative websites in top of the list. Normally the top web sites are full of garbage. Hi there, I discovered your blog via Google whilst looking for a comparable subject, your website came up, it seems great. I’ve bookmarked it in my google bookmarks.